Farmer’s markets are starting to pack away for the winter, and if you’re an ethically conscious eater like us, you’re probably wondering what happens next. Lucky for you, it’s comfort food season, and there are plenty of ingredients available through our craft producers, farmers, and small businesses. Here are some tips and a ~loose~ recipe for just one example: grilled cheese. Softened Butter: It doesn’t have to be anything fancy, just grab something produced on a Colorado farm! If you’ve got some time on your hands, try making your own butter by purchasing a bit of local cream, and shaking it up in a sealable container until the liquid separates from the raw butter. Separate and salt the butter. Use that. Bread: 2 slices of something nice and crunchy. Make sure it’s a loaf that’s got some height, so you have a bit more surface area on the slices to work with. You also want bread that doesn’t come in a plastic bag, but is baked fresh at a small bakery—you know what we’re talking about. No one wants a skimpy grilled cheese sandwich. Cheese: Don’t overthink this. 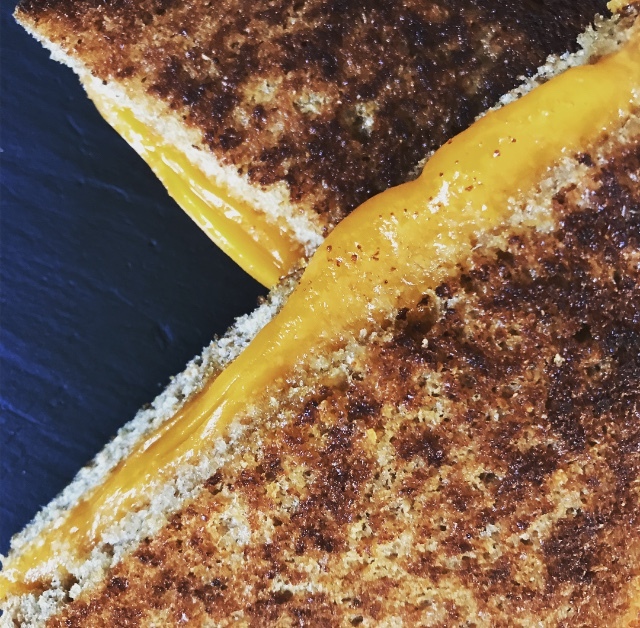 The best part about any grilled cheese is the oozy, buttery, and melty center. Here are some examples of excellent melting cheeses: Melville, gruyere, gouda, fontina, raclette, taleggio, and some cheddar cheeses. Do NOT buy pre-shredded cheese—it melts SO much better if you slice or grate it yourself. Plus, you’re supporting local artisans: win! If you’re interested in visiting an independent cheese shop in Denver, check out places like Cheese + Provisions and The Truffle Cheese Shop. Fillings (Optional): It’s a good time of year to be making grilled cheese, and to jazz it up, fill the center with seasonal produce like roasted squash, a few of the last straggler apples, some local jam, or even some pickled garden veggies. Grilled cheese is also a great canvas for trying to eliminate food waste from your kitchen—sauté up that borderline-wilting kale with some shallots before it’s too late! Preheat an oven-safe frying pan on medium heat. Preheat your oven to 450 degrees. Melt a tab (1-2 tablespoons) of butter, and grate or thinly slice your cheese (I use about 1 cup of grated cheese) while you’re waiting for the pan to heat up. Spread some softened butter onto the outer sides of the sandwich. Layer your sandwich on a cutting board. If you’re using filling, I recommend layering it in between some cheese, so the cheese clings to the bread, and the filling doesn’t slip out all over the place. Toss another tab of butter into your pan and stick that sandwich right into the pan. Cook the first side until it becomes a nice golden brown. Flip the sandwich, lifting it to melt in another tab of butter if necessary (I typically think it is, so both sides get crisp). After flipping the sandwich, sling that pan right into the oven. Keep an eye on the sandwich in there, letting the cheese melt for a few minutes and the bread get nice and golden. When it’s ready, take the sandwich out and immediately transfer it to a cutting board to set for a sec. Cut the grilled cheese in half and serve it with some stone-ground mustard or Colorado pickles, depending on what you’re into.